Hey hey! Time for my December Unblogged Files! 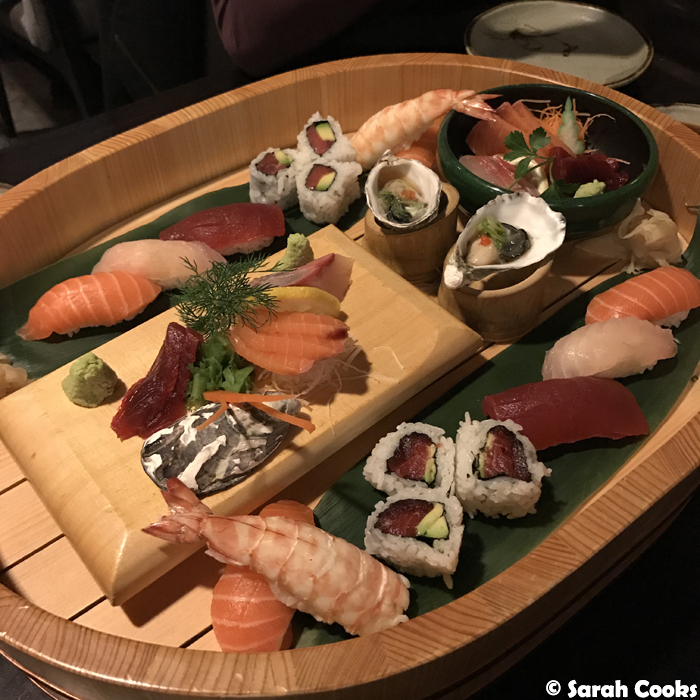 This is a little earlier than usual, as I'm doing a Melbourne edition, covering all the month's eats before we flew off to Germany. This whole year has gone by really quickly, but December, especially, has been so busy! I felt like I'd just been putting one foot in front of the other, trying to get everything done at work and at home, and it didn't really feel like we were actually on holiday until we landed in Germany. Anyway, it's been nice to have some time off to recharge and do nothing! Eat lots, sleep in, catch up on blogging, read magazines, just chill! So, let's begin. 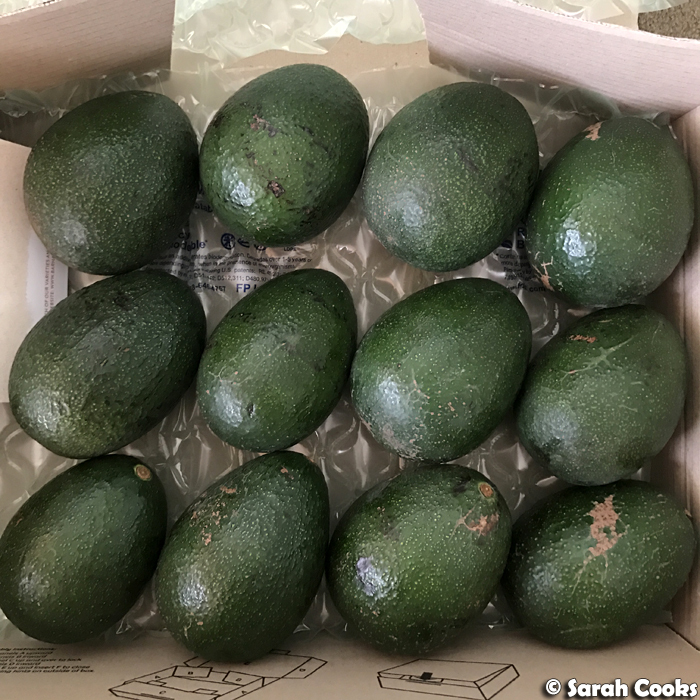 After a short break, the avocados were back! December and January see the shipment of the Reed avocados, the largest (and my favourite) avocados. These are huge, creamy and really flavoursome. With less than a week between their delivery and us leaving for our holiday, we had to eat them super quick! Luckily it was warm, so that helped. (I also chucked a ripe banana in the box to help them ripen faster). We gave half of them away as Christmas gifts, and just whipped through the rest! Lots of avocado on toast for breakfast, and even for dinner one night with a glass of wine. This month I was clearly feeling lazy, because I didn't cook dinner at home often, and when I did, it was usually toast. Fancy toast, but toast nontheless. 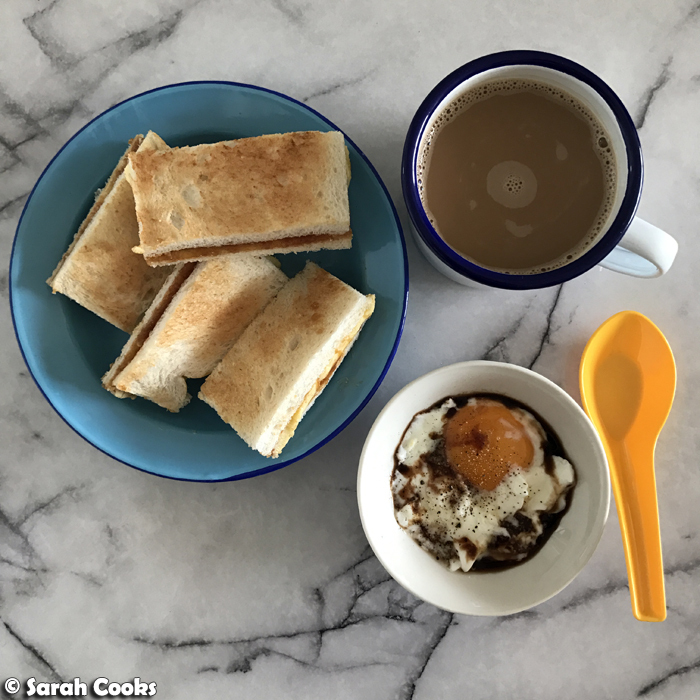 I made kaya toast with half-boiled eggs a couple of times. Once for dinner because I was just craving it, and the next day for breakfast like a normal person. 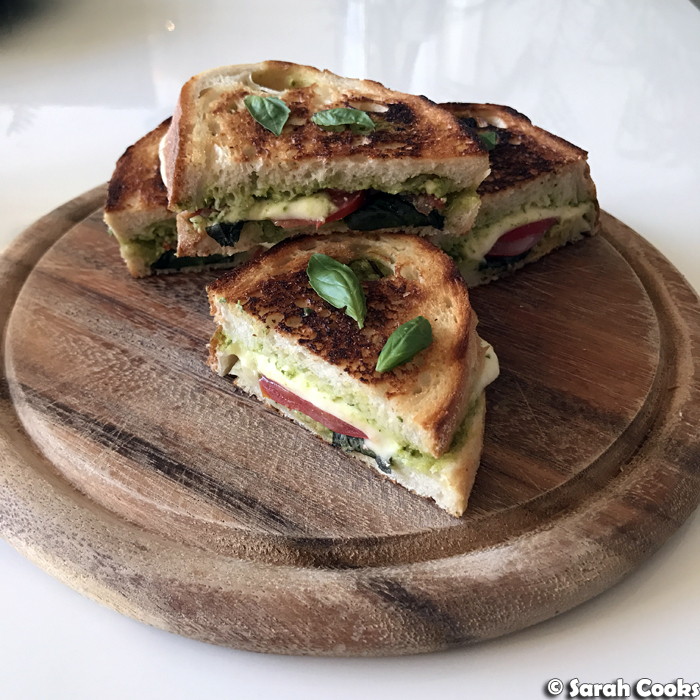 Another night, I made the lovely Lorraine's Caprese Toasties for dinner. Pesto, tomatoes, basil and mozzarella. So good! 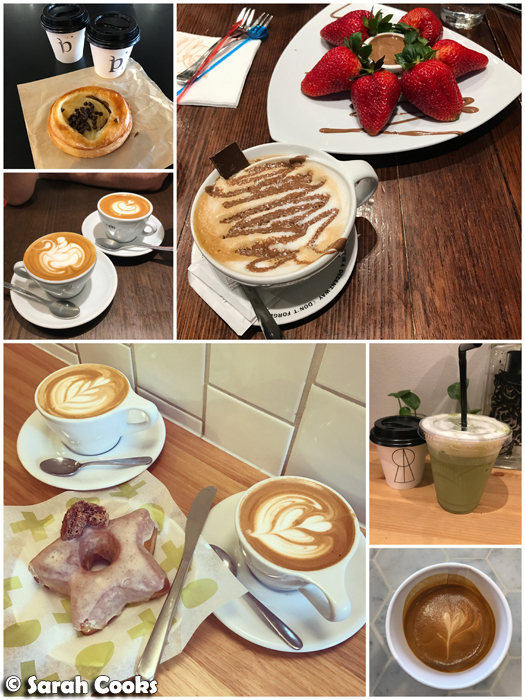 A few different coffees from the month! December also saw lots of catch-ups with friends. I'm not sure what it is about this time of year, but it suddenly seems to become much more urgent that we Absolutely Must catch up and that we don't leave it until next year. One weekend, our friends Adi and Natalia had us over for lunch. 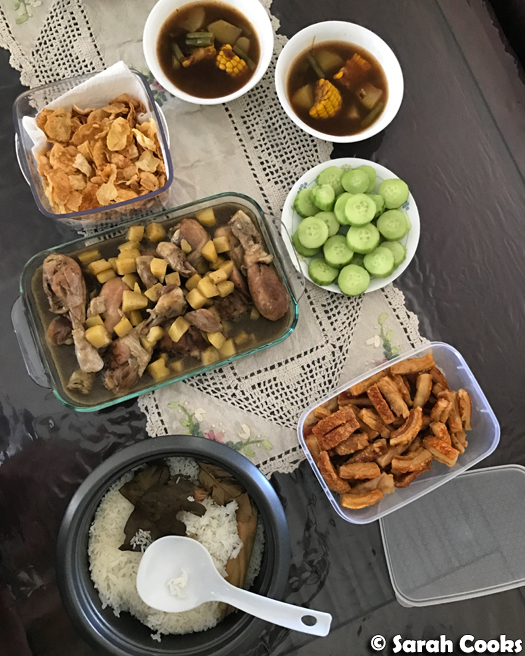 It was an Indonesian feast - ayam opor (chicken curry), sayur asem (tamarind vegetable soup), coconut rice and lots of crackling. So yum! 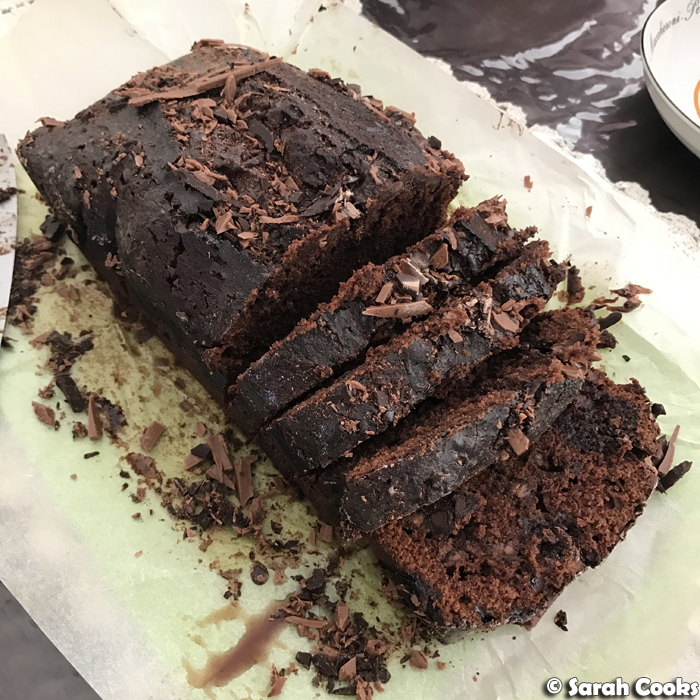 For dessert I brought Nigella's quadruple chocolate loaf cake, an incredibly decadent creation. I don't think I liked it as much as I did when I last made it (11 years ago! ), but it seemed to go down well. (Adi smashed two slices, what a champion). 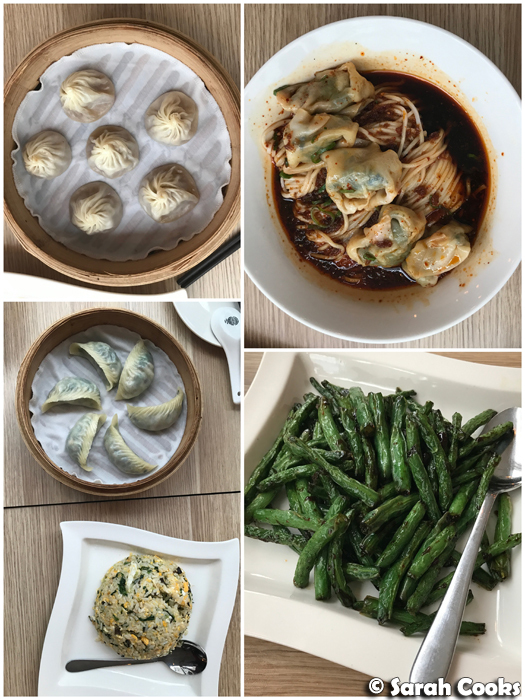 There was also Din Tai Fung (287 Lonsdale St, Melbourne VIC 3000) and Tsujiri (146 Swanston St, Melbourne VIC 3000) with my buddy Zachy visiting from London. 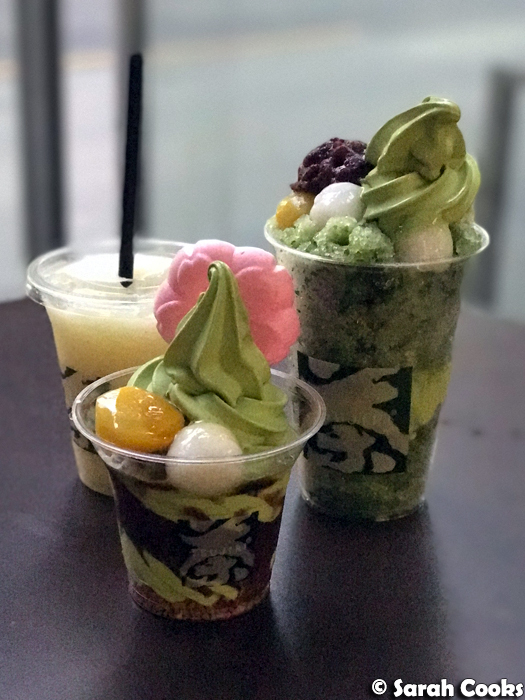 Tsujiri was awesome - I loved the green tea soft serve, and the shaved ice was super refreshing on a warm night. Another night, we did our end-of-year catch-up with my oldest friends at Kenzan (45 Collins St, Melbourne VIC 3000). Love their sushi! Being so busy, I only managed to get to one event in December - the launch of new beer bar Hopscotch (2/4 Riverside Quay, Southbank VIC 3006). 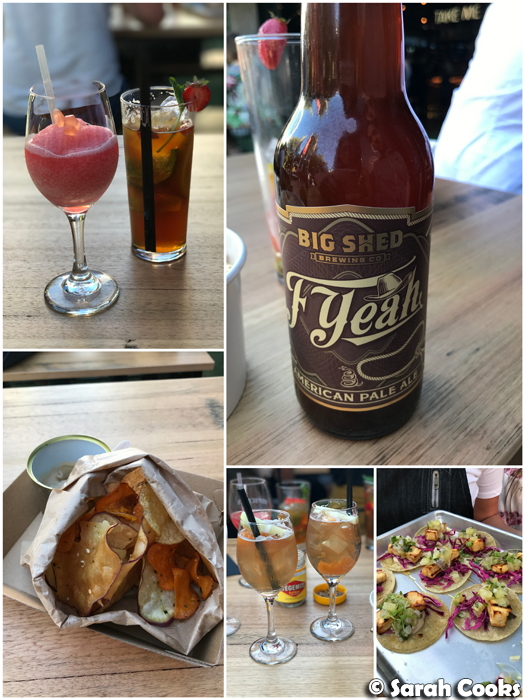 This is a fun and relaxed venue, with thirty beers on tap, lots of snacky foods and the drink of the summer, frosé! Obviously, December was all about Christmas for me (and see my Christmas 2016 posts for further evidence). 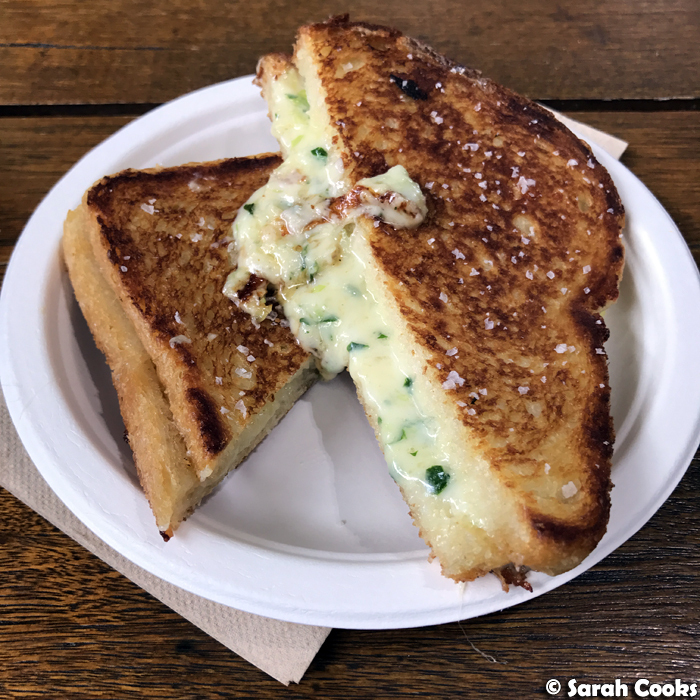 While shopping for our small Christmas lunch at Prahran Market, I finally tried out one of the famous grilled cheese sandwiches from Maker and Monger. (My craving for toasties was not limited to the home!) Maker and Monger are a raclette and grilled cheese bar from the same people who brought you the Spring Street Grocer cheese room. This classic grilled cheese was all kinds of ridiculous - Vermont cheddars, onions and parsley between crisp, buttery slices of bread. 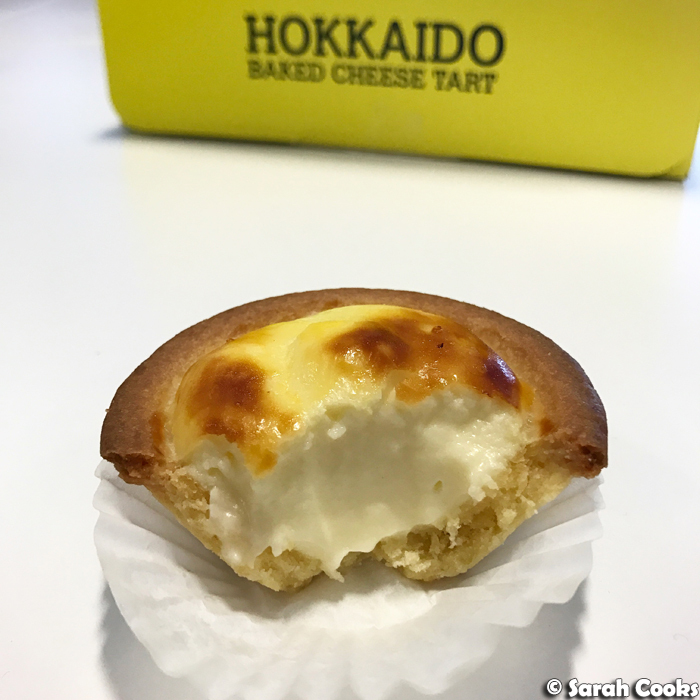 And speaking of delicious cheesy goodness, this December, I also managed to get some Hokkaido Baked Cheese Tarts! Normally I am resolutely anti-queue, but the smell of these has just been too good to resist! After a couple of false starts, I popped down at a non-peak time and only had to wait five minutes. They were soooo delicious - the pastry was super crisp and buttery and the filling was rich and creamy with a nice cheese tang. (I liked them cold from the fridge as well, when the filling was a bit creamier). Would line up for these. 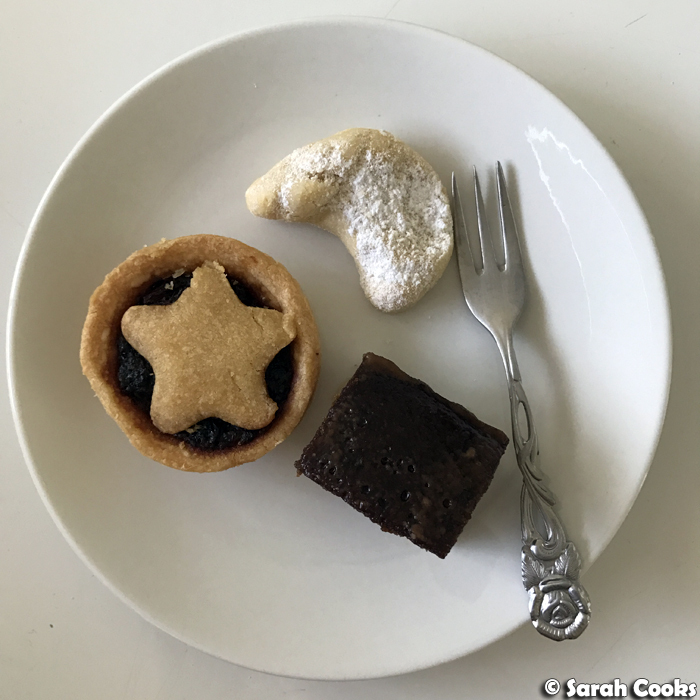 And speaking of delicious tarts, I ate quite a few mince pies this month (although not nearly as many as the industrious Gourmet Chick!) and can safely say that my absolute favourite are the mince pies from Phillippa's Bakery. My dad bought me a packet of these and I was blown away! Perfect ratio of soft buttery pastry to fruit mince. I've tried a few different mince pies this month, and mostly they were too big or too sweet, or had really hard pastry, or just didn't taste that good. These ones, however, were brilliant. Could easily eat a whole packet in one sitting. And that was December! Plans for the rest of December and January? Germany, duh. Woohoo! 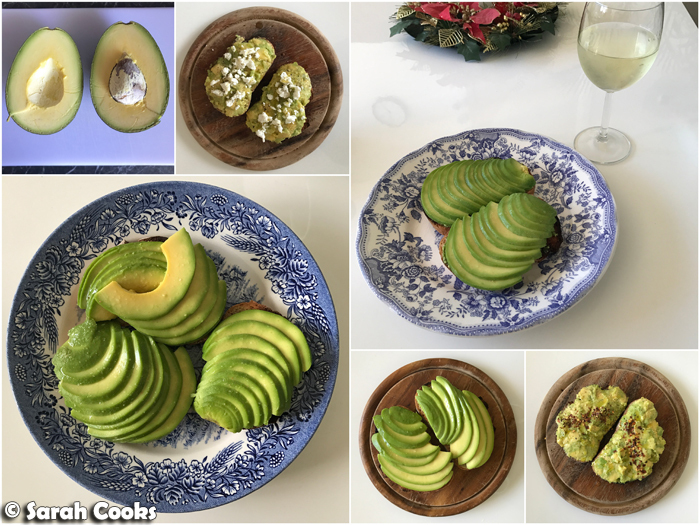 What a delicious month you've had (and I'd be shocked if there weren't avocadoes involved). Thank you for the lovely shoutout! I made your sweet potatoes and they were so good! Whoah that grilled cheese sandwich looks incredible. And haha at your comment on having kaya toast the next morning "like a normal person". Anytime is kaya toast time in my books! Tee-hee-hee, I must say the kaya toast made a most excellent dinner! I shouldn't limit myself to breakfast, heehe. What a fantastic month! Thanks heaps for the shout out and hope your Christmas Day feast was delicious as well :). Stefanie, Prahran Market.